Film buffs and actors in West Bengal are up in arms. On Sunday, many joined a sit-in protest in Kolkata after director Anik Dutta’s film “Bhobishyoter Bhoot” (Ghost of the Future) was withdrawn from almost all multiplexes and single screen theatres in the state. Thespian Soumitra Chatterjee has shot off a letter, calling the decision “vindictive” and “undemocratic”, and a “fascist policy”. The movie had hit 66 screens across 44 cinema halls in Kolkata on the stipulated release date on Friday, 15 February. 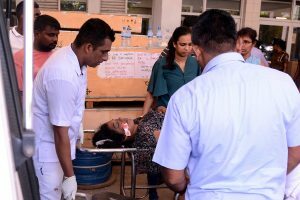 According to Indira Unninayar, co-producer of the film, it was well received by the audience and was running to packed houses before it suddenly vanished from the theatres from Saturday afternoon without any “genuine explanations”. 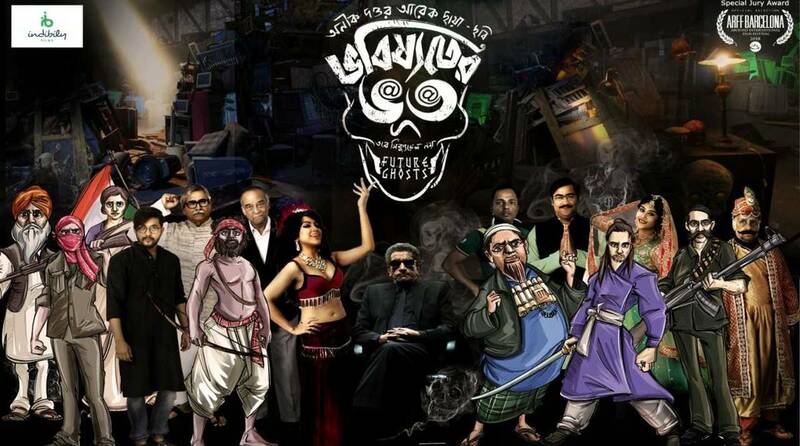 Starring Sabyasachi Chakraborty, Koushik Sen, Moonmoon Sen and Paran Banerjee among others, Bhobishyoter Bhoot is a social and political satire, and comments on a range of contemporary issues through dark humour. It had got clearance from the Central Board of Film Certification. Instructions to withdraw it from theatres apparently came from the police. “After the clearance of the film by the Central Board of Film Certification, Kalyan Chatterjee, the producer of the film, received a call and a letter from the State Intelligence Unit (SIU) asking us to organise a private screening of the film for some senior police officers on a priority basis. The reason cited for the special screening of the movie for the police, was that it was in accordance with the information received by them about the film hurting public sentiments, leading to law and order issues,” said a spokesperson of the film’s producers. The sudden withdrawal of the film caused anger among the movie buffs who said the move amounted to an attack on democracy. A large number of cinema lovers from all sections of society, including students, theatre artistes, actors, singers, writers and members of transgender community gathered at the Metro channel, in an echo of Chief Minister Mamata Banerjee’s call to save democracy a few days back. The cast of the movie, along with crew members were also present to protest against the withdrawal of the film from movie theatres of the city. The producers of the film have written to Eastern India Motion Pictures Association (EIMPA) on the issue, and are awaiting a response from it, as also from the SIU. The movie was earlier embroiled in a legal battle with a top production house that had made the 2012 superhit Bhooter Bhobishyat directed by Anik Dutta himself. He had been sent a legal notice saying he wasn’t allowed to make the sequel of Bhooter Bhobishyat. Dutta, however, won the case. While Bhooter Bhobishyat, a rib-tickling comedy, was about the adverse effects of the rising number of multiplexes and high-rises, Bhobishyoter Bhoot has a rejected lot of ghosts taking refuge in a camp of sorts and wonder if they should claim their place in the cyberspace as there was a threat to their survival in the shrinking real world. Dutta said on Sunday he was yet to get any official communication regarding the cancellation. “All they (hall owners) said was that the instructions were from higher authorities. But I have received immense support and the film fraternity has shown great solidarity,” he said. In his letter, Soumitra Chatterjee said the move to ban the movie was a “vindictive act” of the administration, referring to a comment made by Anik Dutta during the 24th Kolkata International Film Festival last November. Dutta had criticised the “excessive” use of CM Mamata Banerjee’s posters around the film festival venues, and said film personalities should get more limelight during such events. Chatterjee wondered if there would be “any platform in the country where people can express themselves freely” and whether filmmakers would be able to include any content with which the authorities did not agree. “I strongly condemn such fascist policy even if they stay undercover,” he wrote. In his letter, Chatterjee said he hoped all those responsible for taking the film off the cinemas “will realise that it is an undemocratic act’ and ‘protest against it”.